I will but might have to use the others short term. I did not have a lot of time last night but I did determine that the woofers section is fine. Since I had never heard the speakers play with the ribbons totally dead I did not realize how subdued the sound was when coming only from the woofers. Last night I disconnected the ribbon on the good speakers and confirmed that both sound the same. So now I am chasing only a part in the ribbon section. I have to make a quick trip to SC today and tommorow but should be able to get back on this project Saturday. Thank you to all of you for your advice. This is what i know so far....and please check my logic for a path forward. The woofer section is good. The ribbons produce zero sound. I think I know that C1 is good. I removed from the circuit and chacked capaictance with a VM. It measures about 106. I do not have an ESR meter so I guess I can not be absoutley sure. Can I rule out for the moment the loop at the top of the diagram that goes through RP1? It would seem to me even if this was bad or shorted i would still get sound from the ribbons. It would appear to me that there is some break in the cicuit after C1. As RobertR has suggested, I plan to address L1 next. Ed - Glad your woofers and their circuitry are OK. Just running the woofers alone always sounds surprisingly unimpressive. Come to that, the ribbon alone can sound awfully disappointing, too. You really need both! You did run the ribbon alone, right? That ribbon running straight off the amp is quite over-bright - clean, but unmusical - in fact nearly unbearable. Quickest way to test L1 for a total shortout is just disconnect one end. If ribbon output does not return, it's probably perfectly OK, and something else is kaput.. The whole series of L2, L3, and L4 all need to show continuity, or your ribbon output would be seriously curtailed. In the odd event that C6 [4@250v] were shorted out, you would lose a lot of output, too. The rest of the stuff is response shaping. Various tweaks - notch filters: one at around 6KHz, one at 3300 Hz, etc. Hope you bring the TFM-75 along, and get it bench tested. Who knows? Maybe it clips below the output level it should have. Unlikely, but it always fells better to know for sure that she's putting out the full potential. I'm not sure when you said you used a volt meter to check the cap if you mean you're using a cap measurement position, or doing a resistance measurement. Doing a resistance measurement, a VOM is simply applying a DC voltage. So you will see a working capacitor start charging up. So you'll see the number climbing and climbing and... I would think a failed cap in a circuit like this would tend to go open or pop an end if it was over voltage, not short and just sit there. It you have a steady reading, then it's either a cap reading function or it is in a shorted or near shorted state, I would think. Failed filter caps in a power supply often have dried up, go short for a moment and then get blown open as a result of not handling the current that results. That's why sometimes an electrolytic before going off like a firecracker will run very warm. That means they're passing too much current and they're poor resistors. A cross check might be to take another cap and simply touch it across one and see if that changes anything. Even a wrong value would probably tend to get something for audio. Easiest if you had a non-polar like a .33 orange drop or one of those yellow jobs that are pretty common. If you don't get this figured out before fest time, then certainly bring it and we can get it done then! Robert R wrote: Ed - Glad your woofers and their circuitry are OK. Just running the woofers alone always sounds surprisingly unimpressive. Come to that, the ribbon alone can sound awfully disappointing, too. You really need both! I had a few minutes before I left town today to check a couple of things. I lifted a leg from L1. It reads 2.2 ohms as it should. With it out of the circuit I still have zero output from ribbon. Imresoldered it back in. I did the same on L2. It is supposed to read 0.075 ohms which unthinking too low for my meter to get a good reading. It does however show continuity. With it out of the circuit still zero output from ribbon. I soldered it back in. radioeng2 wrote: I'm not sure when you said you used a volt meter to check the cap if you mean you're using a cap measurement position, or doing a resistance measurement. My meter has a setting to check caps. I am not sure how reliable it is but on C1 totally removed from circuit I get a steady reading of 108 if my memory is correct. sea wrote: My meter has a setting to check caps. I am not sure how reliable it is but on C1 totally removed from circuit I get a steady reading of 108 if my memory is correct. I would be inclined to believe that's a valid check and that it's good enough to not prevent audio. Just watch the upper limit of that cap check function. On some meters, it's not all that high. Also, before checking any cap, short across it to make sure it's discharged before measuring. Voltage on it can damage a capacitance meter. I've seen it happen. I'd still think a fast way to find an open, which this sounds like, is to play audio at a modest level in and put the VOM to AC. Minus lead to the minus input and the + to the plus input. If you see it bouncing at the + input, then just follow that thru until you see the audio go away voltage wise. Then focus on that area or why that drop happens. Thanks Mark. I will try that when I get home. Before you mess with your crossover any more it would be a good idea to test that ribbon again - it could be intermittent at this point. This happens sometimes when the aluminum trace fractures - it's able to sometimes still touch together, end to end, to the extent that everything seems fine - until there is a temperature or humidity change, or just the right note or vibration to open up the circuit again. If it still plays when an amp is hooked directly to the red and black wires, let it run a while. It should sound clean, though exceedingly and annoyingly bright. If it's zapped, most likely it will be right at the point at the bottom where the traces meet their little contact PCB. Based on Roberts advice I took a closer look at the ribbon. More next. I discovered a problem where the black common wire connects to the ribbon. 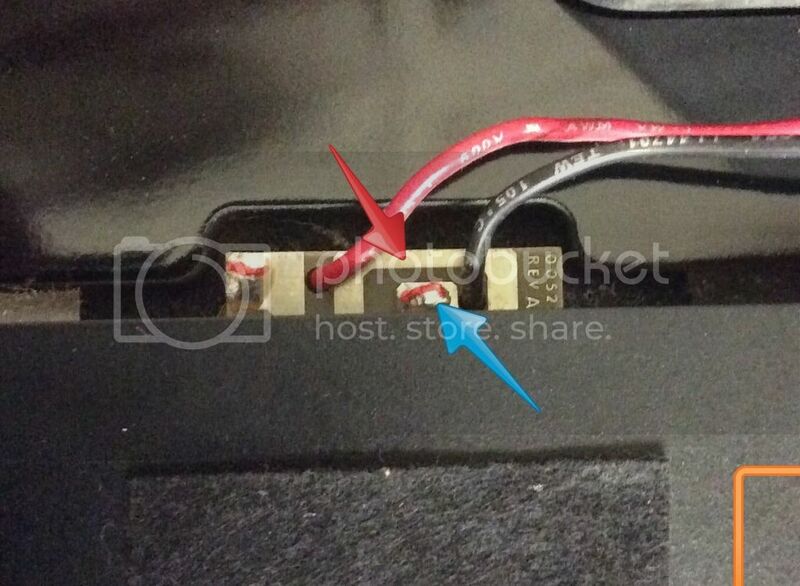 In the photo below, on the good speaker/ribbon, I have continuity between the arrow indicated points. On the bad one I do not. When I short between the two points the ribbon appears to work normally. I thought I had a bad solder joint at the blue point so I cleaned it and re soldered it......no change. I could just solder a little jumper between the arrows but this does not seem to like the correct way to fix. I wonder if some connection internal in the ribbon got trashed. I, of course, do not want to do any disassembly of the ribbon to find out. Excellent. You've found the issue and just have to figure out what exactly is the best fix now. Looks to me like the wire goes through the hole and then the stripped end comes back down through the board for the solder connection. This likely was done so that intense vibration of the woofer movement didn't have the ability to directly flex that soldered connection. What the difference is between the trace that circles that and the solder point is, I can't tell from the pic. One of the guys that've been in there should be along and be able to tell you right off if just a jumper between will be fine. Just use care since that's the end of the ribbon area. Sounds like Robert nailed it...again! Ed - when you say it seems to be working normally, how normal it that? What I mean is, you will get sound if you jumper something that hooks just two traces out of the four back into action, but that's not what you want. The entire ribbon should read at least 4 and a half ohms. Try measuring the part you got to play and see what the resistance is. Actually, whatever the problem, you are going to have to remove the ribbon from the cabinet and take out the little circuit board. That can be done without disassembling the ribbon, something you definitely do not want to do. Cut the two wires first; they can be spliced later, with a bit of heat shrink and solder. All the outer screws in the metal flange have to come out. There are 10 - five a side - on a 48" ribbon, so I suppose 12 on your 60" - usually square-tip. Those magnets are powerful and will try to swallow anything they can, like your tool tip, or loose screws. So use care - easy to make things worse. The other bolts, the ones that hold the ribbon together, should not be touched. Get it horizontal, and with the right little open-end wrench and a small Phillips you can remove the locknuts and bolts that hold the little circuit board, remaining wires still attached. What you see then is that there are four contacts that match up to the ends of the four aluminum traces. There is another little board at the top end, with a different bit of circuity, that reverses the direction of the traces. So electrically it's all one trace, but folded just so into a magnetic field -in - up-down-back up-back down, and return. Any break in continuity and that ribbon makes no sound at all, crossover or not. Anyway, you have to find the break, or breaks - it could be the board got fried somewhere, but more likely one or more traces are broken straight across, right above where the edge of the board meets the ribbon. And it could be broken and still read continuity when you happen to measure. A lot of light and a good magnifier can help here. An ohmmeter (the kind that beeps for continuity is handy) with very dull probes used with a very gentle touch can be applied right to the trace and used to isolate the open point (or points). First let me say how grateful I am to all of you for your help. I have taken the ribbon out and removed the little PCB from both ends. RobertR, you are exactly right. I have continuity in 3 of the 4 traces. The fourth looses continuity right as it appear to go between the pressboard plates. It I check for continuity at the closest spot beyond.....it is already broken. I can not see any trauma. I made a 1 inch long piece of foil the width of a single ribbon trace about 6 thicknesses of foil. I gently pushed it between the broken ribbon trace and the pressboard frame. After I reconnected the little PCB's I had good continuity from the start to the end through all four traces. For now at least all sounds good.